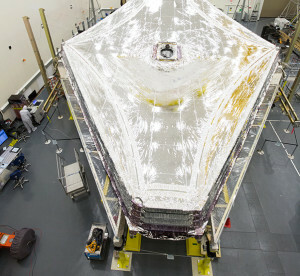 At Northrop Grumman highbay facilities in Redondo Beach, Calil., NASA’s James Webb Space Telescope’s five sunshield layers are fully tensioned for the first time. REDONDO BEACH, Calif. — Northrop Grumman, which designed NASA’s James Webb Space Telescope’s optics, spacecraft bus, and sunshield for NASA Goddard Space Flight Center, has deployed the sunshield subsystem and fully tensioned the five sunshield layers for the first time. In space, the sunshield subsystem divides the JWST observatory into a warm sun-facing side and a cold space-facing side comprised of the optics and scientific instruments. 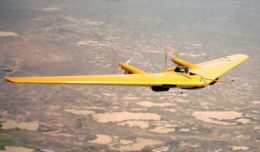 The sunshield subsystem, which includes the structure and mechanisms required for deploying the five-layer subsystem, was designed, manufactured and assembled by Northrop Grumman, with the five membrane layers manufactured by the NeXolve Corporation in Huntsville, Ala. The flight membranes will be folded, stowed and tensioned again two additional times for testing. The folding and stowing method is how the membranes will be folded and stowed for launch. The sunshield layers, known for being the size of a tennis court, will protect and prevent the background heat from the Sun, Earth and Moon from interfering with JWST’s infrared sensors. The sunshield layers, each as thin as a human hair, work together to reduce the temperatures between the hot and cold sides of the observatory by approximately 570 degrees Fahrenheit. Moving from the sun-facing layer to the one closest to the telescope, each successive layer of the sunshield, which is made of Kapton, is cooler than the one below. The sunshield, along with the rest of the spacecraft, will fold origami-style into an Ariane 5 rocket. The James Webb Space Telescope, the scientific complement to NASA’s Hubble Space Telescope, will be the premier space observatory of the next decade. Webb is an international project led by NASA with its partners, the European Space Agency and the Canadian Space Agency.